The Corinthian capital near the top of Nelson's Column was cast from cannon salvaged from the wreck of HMS Royal George. The Corinthian capital is made of bronze elements, cast from cannon salvaged from the wreck of HMS Royal George at the Woolwich Arsenal foundry. It is based on the Temple of Mars Ultor in Rome, and was modelled by C. H. Smith. The bronze pieces, some weighing as much as 900 pounds (410 kg) are fixed to the column by the means of three large belts of metal lying in grooves in the stone. HMS Royal George was a 100 gun First Rate ship of the line, built to the 1745 Establishment, which is now more famous for having foundered at her mooring in Portsmouth Harbour with huge loss of life. An Establishment was a series of detailed specifications within which the Master Shipwright at a shipyard was expected to design a new ship. The Age of the Establishments lasted until the mid 1750's and ended because on the whole, the ships built to the 1745 Establishment, particularly the Third Rate ships of 70 and 80 guns were unsuccessful, slow, cumbersome and sailed badly. French and Spanish ships of the same period were superior in many ways. The Age of the Establishments came to an end when the Surveyors of the Navy, starting with Sir Thomas Slade began to produce the designs centrally, enabling ships of identical design to be built at different shipyards. HMS Royal George was unusual in that when built, she wasn't actually a completely new ship (if that makes sense). The ship had started her life as a 90 gun First Rate ship called HMS St Andrew, originally built at Deptford and launched in 1670. That ship served until 1702, when she was broken up at Woolwich and rebuilt as HMS Royal Anne, being re-launched in 1704. 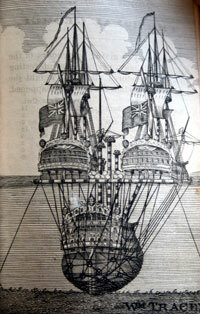 HMS Royal Anne then served until 1727, when she was broken up at Chatham, the intention being to rebuild her again. This didn't happen and her timbers were stored at Chatham. At some point, they must have been taken to the Woolwich Royal Dockyard to be rebuilt again, because HMS Royal Anne was ordered to be rebuilt there in 1746, at the height of the War of Austrian Succession The ship which emerged from each of these rebuilds only bore a small resemblence to the ships previous appearance and so it was with her second rebuild. The 'new' ship was designed by William Lee, Master Shipwright at Woolwich Royal Dockyard within the 1745 Establishment for a 100 gun First Rate ship, so a considerable amount of new timber was used in the latest rebuild, as the new ship was 8 ft longer and 300 tons heavier than the old one. She was one of two First rate ships built to the 1745 Establishment, the other was HMS Britannia, launched at Portsmouth in 1762 and broken up at Plymouth in 1825. When launched, HMS Royal George was the largest ship in the world and was the first British ship to exceed 2,000 tons. The ship was ordered on 29th August 1746 and was laid down at Woolwich on 8th January 1747. Her name was changed from Royal Anne to Royal George on 19th January 1756 and the ship was launched into the Thames a month later. On completion, she was 178' long on the upper gundeck, 51' 9.5" wide across the beam and fully laden was a ship of 2,046 tons. As completed, she was armed with 28 42pdr long guns on her lower gundeck, 28 24pdr long guns on her middle gundeck and 28 12pdr long guns on her upper gundeck. In addition to these, she carried 12 6pdr long guns on the quarterdeck with 4 more on the forecastle. She was manned by a crew of 850 men, officers and marines. By the time the ship was commissioned, she had cost £65,274, 8s, 2d. 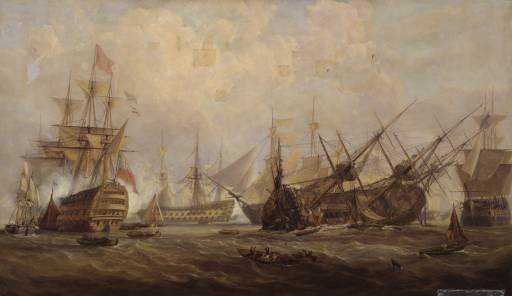 When the ship was commissioned, the Seven Years War was ongoing and the ship joined the Channel Fleet, then commanded by Admiral Sir Edward Hawke. HMS Royal George was the flagship of Vice-Admiral Edward Boscawen when she participated in the Raid on Rochefort in September 1757. This occurred at a time when the Prime Minister of the day, William Pitt the Elder, was advocating a series of 'descents' or amphibious raids on French home territory. The land forces element of the raid was to be commanded by Sir John Mordaunt and his mission was to seize the port, destroy it and then leave. After seizing the Ile d'Aix, it soon became clear that the strength of the defences at Rochefort had been grossly underestimated and the rest of the raid was called off. After that, she ship was employed on the blockade of Brest before becoming Hawke's flagship in November 1759, when his flagship, HMS Ramillies was recalled for repairs. The ship was serving in that role when she participated in the Battle of Quiberon Bay on 20th November 1759. During that battle, HMS Royal George engaged the French vessel Superbe and damaged the enemy ship so badly that she capsized. The victory was so overwhelming, with 6 French ships of the line sunk and one captured, that the power of the French Atlantic Fleet was broken, leaving the British free to do as they pleased. Such was the scale of the defeat that France suffered a credit crunch and the French Government was unable to borrow enough money to realistically continue with the war. The war had left the British government virtually bankrupt and in an effort to pay it's huge debts, the Government attempted to levy taxes on the colonies in America. This led to unrest in the colonies which by 1775, had erupted into open war. As the war escalated and the old enemy France became increasingly involved, the Royal Navy began to mobilise it's fleets and HMS Royal George was recommissioned in July 1778. In her initial involvement in the American War of Independence, she served as flagship to Vice-Admiral Sir Robert Harland in the Channel Fleet. By December 1779, she was part of Vice-Admiral George Rodney's fleet which relieved Gibraltar, as flagship of Rear-Admiral Sir John Ross. Under his flag, whilst en route to Gibraltar, the force encountered a large Spanish convoy, carrying naval stores for the fleet at Cadiz, Vastly outnumbered and outgunned, the entire convoy was taken by the British. One of the Spanish warships captured, the 64 gun Guipuzcoana was renamed HMS Prince William on Rodney's orders, in honour of Prince William (later King William IV) who participated in the action. On 16th January 1780, the ship participated in the Battle of Cape St Vincent (1780) as part of Rodney's fleet. This battle was unusual because it took place at night and is sometimes known as 'The Moonlight Battle'. It was the first victory for the British in a major, set-piece naval battle over their European enemies in the American War of Independance. The battle was also significant because it proved the benefits of the then new British practice of sheathing ships bottoms in copper. It was an overwhelming victory for the British, capturing six Spanish ships and destroying one out of a total Spanish fleet of 13 ships. In late 1781, HMS Royal George became flagship to Rear Admiral Richard Kempenfelt. He had become famous because it was he who invented the system of signalling flags still in use today. On 28th August 1782, HMS Royal George was anchored off Spithead, preparing to join Vice-Admiral Richard Howe's fleet in another relief of Gibraltar. In addition to her crew of 850 men, she had aboard workmen from the Dockyard at Portsmouth, there to speed up the repairs, plus 200-300 relatives visiting the men and 100 or so 'Portsmouth ladies.....seeking neither husbands nor fathers' (I'll leave that to your imagination) and local traders selling their wares to the sailors. Repairs needed to be carried out on or below the water line on one side of the ship. The exact number of people aboard is estimated to have been around 1,200. At 7.00am on 29th August 1782, the guns on one side of the lower gundeck were moved to the centre of the gundeck, altering the ship's centre of gravity and causing her to lean over. This was intentional. What wasn't realised was that the gunports on the other side hadn't been properly secured. In fact, a number of them were open as a lighter was alongside loading barrels of rum onto the ship via the gunports. By the time the mistake was realised, it was too late. Water was rushing into the ship via the open gunports and the 'free flow' effect was causing the ships heel to become uncontrollable. The ship rolled onto her side and although the lighter alongside stopped her sinking immediately, it was only a matter of time and within minutes, the ship had filled with water and sank. It is thought that a number of the lower gundeck 42pdr long guns fell through the deck as a result of rotten deck beams under the centre section of the deck giving way under the three tons plus weight of each gun. This in turn meant that as soon as the problem was realised, the crew were unable to move all the guns back to the gunports, which would have righted the ship before she rolled over. Of the 1,200 people estimated to have been aboard at the time of the sinking, there were 300 survivors, making it the worst accident ever to have occurred to this day in the confines of a British port. Of the 60 children estimated to have been aboard, only one survivor was found. Rear-Admiral Kempenfelt was one of those who perished in the disaster. 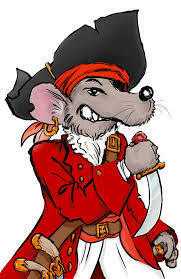 He had been in his cabin when the ship sank and was trapped when the doors jammed shut as a result of the ships heel. A Board of Inquiry was quickly convened, but failed to identify a culprit, placing the blame instead on 'the general state of decay of her timbers'. Not surprising given that some of her timbers were 110 years old at the time of her loss. The Board of Inquiry suggested that the cause of the sinking was that part of her frame collapsed during the heel. Lying where she was, in 65 feet of water in the middle of a major naval base, the wreck was a hazard to navigation and several attempts were made to raise the ship. The Admiralty received 117 responses to a request for proposals to raise the ship. The eventually settled on a proposal made by a Portsea Shipbroker called William Tracey. His proposal involved running ropes and slings around the wreck and securing them to a raft made from barrels. The ropes and slings would be made taut at low water and when the tide came in, the ship would lift from the seabed and could then be moved to shallower water. This did succeed in moving the wreck some 30 ft along the seabed, but the attempt was abandoned due to poor weather and by interference from the Navy Board, perhaps afraid of what might have been discovered. In 1834, John and Charles Dean, using the first pumped air diving helmets (which they had invented), recovered guns from the wreck. While these operations were ongoing, they were asked by local fishermen to investigate an object on the seabed about half a mile away which they were continuously snagging their nets on. Thus was the wreck of the Mary Rose discovered. In 1839, Major-General Charles Pasley, then Colonel-in-Chief of the Royal Engineers, began to work on the wreck. His work set a number of diving milestones, including the first recorded use of the 'buddy' system when he ordered that the divers work in pairs and the first medically recorded instance of 'diver squeeze'. Between 1839 and 1842, Pasley's men had recovered 30 guns, plus timbers, surgical instruments, clothing and many other items. In 1840, the bulk of the wreck was blown up in an explosion which shattered windows in Portsmouth and Gosport.